Typical classrooms have a literacy-rich environment that encourages the use of communication and writing while learning to read. Typical classrooms have verbal peers to build the social relationships that students with Rett Syndrome need to have exposure to. That is not to say that inclusion is perfect. In fact, this course is designed to highlight some of the pitfalls to avoiding “Inclusion by Geography” while emphasizing the practices and strategies that support a truly inclusive program. 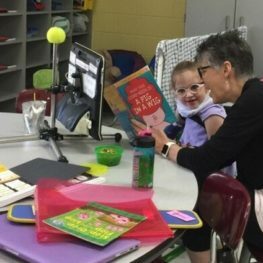 Examples are given of inclusion practices and strategies that grow academic, social and communication skills for students with Rett Syndrome while enhancing the development of typical kiddos as they broaden their skill sets in relating to those who communicate differently from them.